These were taken quite some time ago, and I only wish I could get away with wearing a flowy skirt out. If I tried that stunt now I'd be wobbling around like a penguin with its arms clamped tightly to its side. It gets windy here for fall/winter! So sadly, I can only post this and reminisce of lacy skirts and bare legs. 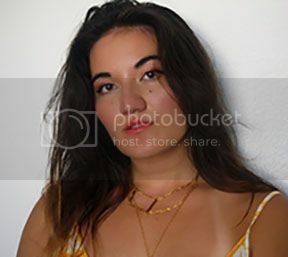 I bet you'd started to think that I only owned one top after the previous posts featuring that same shirt from American Eagle. What can I say, its incredibly versatile! But have no fears, I do happen to own quite a few other tops as well, and this tropical print one is a thrifted gem that I particularly enjoy. I plan on pairing it with some leather leggings next! You know, working at a restaurant has often made me think how much I dislike people. Okay, its borderline hate, especially when I have to go check the bathrooms and see the gross mess they leave behind. However, there are certain individuals that can help make a work day better. I had one such gentleman last week who brightened up my eight hour shift. He was an elderly fellow, with sparkling blue eyes and a ready smile. After I rang him up and gave him back his card, he grabbed my hand instead. "It's not often an old man like myself gets to hold hands with such a pretty lady," he said sweetly. I couldn't help smiling at that and responded, "Well, it's not often I get to hold hands with such a charming man." He chuckled and wished me a good day before heading in. Its those little moments with strangers that can make such a difference. I need your beanie in my life!!!!!!!!!!!! And your shoes of course! Aw, that old man sounds so cute! Speaking of cute, this outfit! I love this top and how you took a girly outfit and put a "Linda" spin on it with spikes and beanie. You look great! People can be so gross! I can only imagine their homes. Yuck! That's a great outfit. I love the lace detail. What a sweet old man! That was too cute. Tropical prints are the best! I love how you styled this with the beanie, it adds a nice touch. Ohh, working at a restaurant. Good times. As long as there a good moments like this then the bad are more tolerable! Adorable look too! Love the girly lace and heels with the spikes and beanie. And a denim jacket is always perfect. You look darling, I love your top! Awww, I worked as a barista over the summer and I loved little moments with strangers like that! It really does brighten your day. You look beautiful! Sometimes my job makes me hate people as well. It seems like all they want to do is see the bad in people. very very nice post..you are so sweet!! ;))) amazing outfit. amazing outfit! interesting top indeed! LOVE the print and how you wore it a lace skirt! i really like those strap heels, so chic! Such a cool look, love the touch of the denim jacket. u look very pretty! i love the combination of sweet items and masculine jean jacket! Aaaaw, isn't it just the loveliest thing when people are super kind to you? :) Honestly, old folk are the best! Usually so sweet and so kind and understanding. I know what you mean by people leaving messes... seriously, is it that difficult to be clean in a public area? Apparently, it is! Shame shame. Well, I hope your Friday is going splendid-ly, Miss Linda. I seriously adore this outfit--those heels are somethin' fierce, and I envy your hat-wearing abilities!! Oooh classy lady! You look stunning! No wonder the boys can't keep their hands off you! ;) Speaking of boys, how's it going with your movie date cutie?? P.S. My computer is suddenly nervous about getting a virus from your site...any ideas? I'm puzzled! I wish I had a story as charming as yours to share about my waitressing days... But I can tell you I agree with you about people being pigs. Once a girl did number two NEXT to the toilet bowl. That was pretty ... Discussing doesn't even begin to describe it. But on to more pleasant things...:D Your skirt, your top, your heels, your hat and your legs are phenomenal! haha i think its awesome to see you wear one top in so many different ways. and lovely outfit! 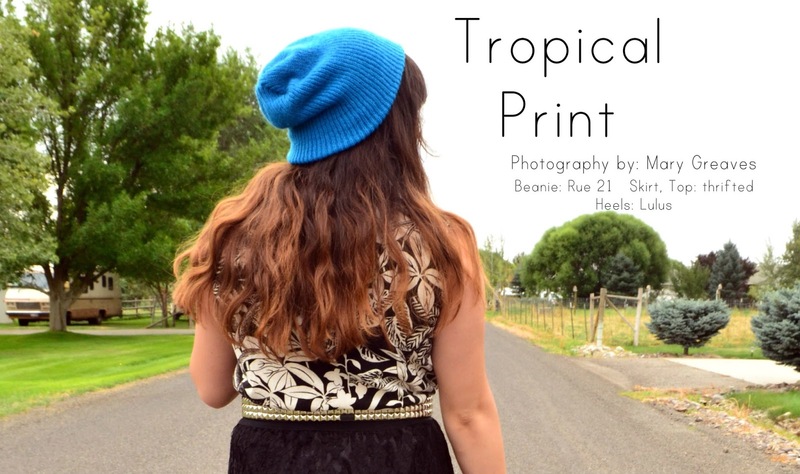 I've recently been wanting to try out tropical print. and love those heels! 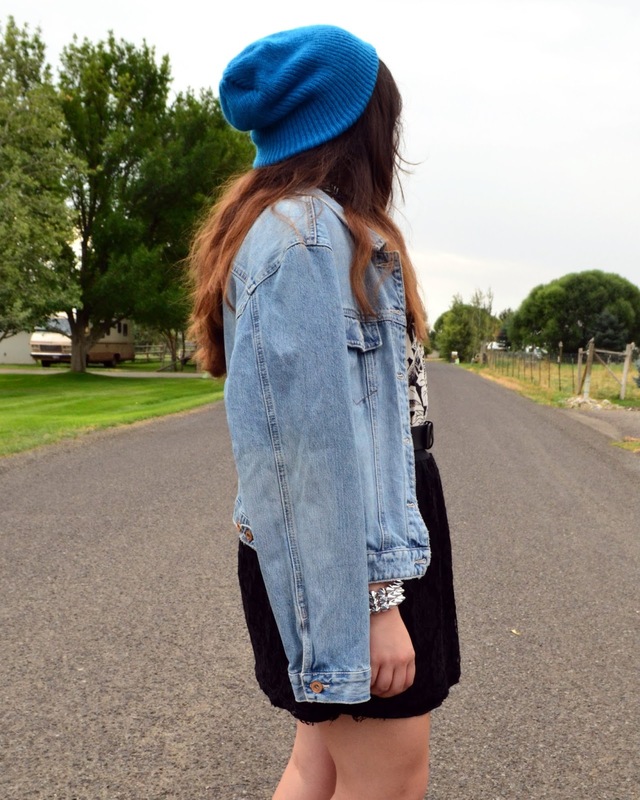 cute outfit expecially your blue beanie!!! Nice!! That blouse is gorgeous! You know, i have a pair of shoes like those and they hurt soooo much :( Don't you have the same problem?